Donald Harris saw the ball come off the White Sox bat, at first he just sat there, he told The Chicago Tribune. Then he took off. The first-place White Sox looked to clinch the division. Harris catching that bloop would help prevent that, at least preventing them from doing it against Harris' Rangers. Harris ran it down. "Just hearing of the words from those guys over there, about how they wanted to win (the division) in front of the second-place team, gave me the determination to get there," Harris told The Tribune afterward. "There was no way we wanted to let them win it here against us." Harris was in his third season with time running down fly balls in the majors, balls the opposing team didn't want him to catch. It was a skill that not only helped Harris in baseball, but it also helped him on the football field, as a defensive back at Texas Tech and a brief training camp signee with the Cowboys. While Harris' baseball career with the Rangers would be a bit longer than his football career with the Cowboys. His big league career, though, still lasted through parts of only three seasons, ending days after that game-saving catch against the White Sox. 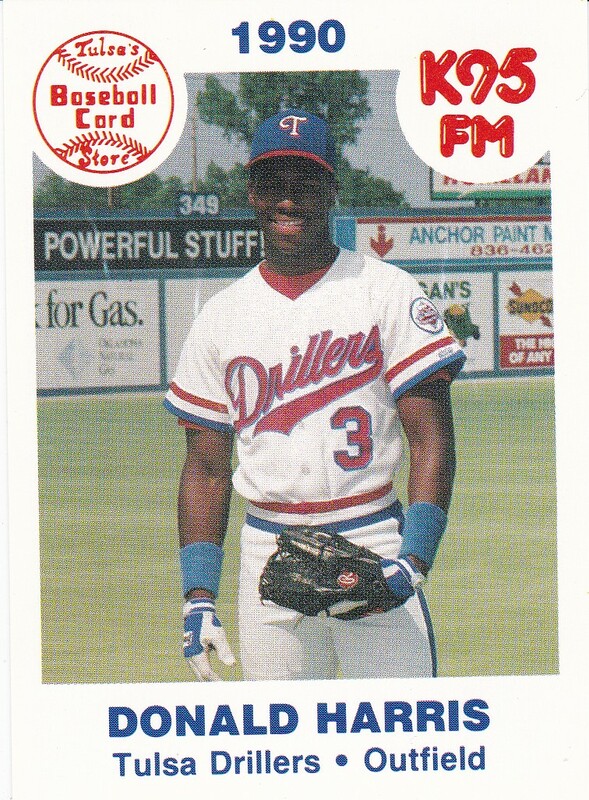 Harris' career began out of college, taken by the Rangers in the first round of the 1989 draft out of Texas Tech. Harris was taken two spots ahead of Frank Thomas. At Texas Tech, Harris played both baseball and football. In baseball, he hit over .300 in both 1988 and 1989. In October 1987, Harris contributed to a 42-0 win over Tulsa - a city in which he would later play baseball - by intercepting a Tulsa pass on their first possession, running it back 64 yards to set up Texas Tech's first touchdown. Signing with the Rangers, Harris played 1989 at rookie league Butte, hitting .284, with six home runs. His second year, though, saw Harris' batting average dropping below .200, between AA Tulsa and single-A Gastonia. He also hit four home runs between them. Harris returned to Tulsa for 1991. He still hit just .227, but he did win a September call up to Texas. He got into 18 games, again mostly on defense. His plate appearance totaled nine, but he did get three hits. For 1992, Harris returned to Tulsa to start the year. By July, he was back in Texas. He got into 12 games that month, getting three hits in 21 at bats. Then he turned to his old game, football. He signed a two-year deal with Dallas, joining the team on its trip that year to Japan. "He's not crossing off baseball," his agent Jordan Woy told The Associated Press, "but he wants to see if he can be among the select few to play both sports." Harris, though, was cut before August was out. It'd been too long since he last played. But he answered a question for himself, Harris told The AP. "When I first came out, I was wondering if I could play the game," Harris told The AP. "Now, I realize that if I'd have come straight out of college, I would've definitely been able to play the game." Harris returned to the Rangers. In September, he returned to the majors. He got into 12 more games, getting three more hits. He then got his 40 games in 1993. But he still just got 15 hits in 76 at bats, for a .197 average. It was his final season in the majors. Harris, though, continued playing into 2000. He played in the Rangers system into 1995, then moved to the independent leagues, playing at Bend, Lubbock, Madison and elsewhere, ending his career.